Gwen Stefani has been one of my favourite artists for years. She is not only a brilliant solo artist, but my favourite work from Gwen Stefani was in her band No Doubt. Gwen has always had a signature classic look. Simple makeup, then vivid red glossy lips. The look is really easy to create. The perfect products to recreate Gwen's look are fairly simple, but products with an impact and lasting power. Gwen's base can be recreated using the Illamasqua Skin Base foundation, Clinique Even Better Concealer and MAC Studio Fix Powder. Her eye's, always simple, can be recreated using MAC eye-shadows in shades Blanc Type, and Omega for your brows. For contouring, the Smashbox Contour Palette is perfect and for lips you can use MAC Cherry lip liner, MAC Russian Red lipstick and Bourjois 3D lipgloss! 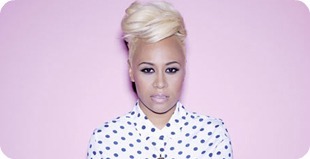 I don't know about you, but Emile Sande blew me away at the Olympics opening ceremony. She has such a gorgeous face and her make up always accentuates her features perfectly. Again, a pretty classic look as with Gwen. You could use NARS Sheer Glow, Ben Nye Concealer & Corrector palette and MAC Pro Mandy Gold Foundation palette for the base. MAC Blackground paintpot and Avon Glimmerstick in Smokey Diamond for the eyes with Topshop Lash Catcher Mascara. A dash of Bobbi Brown Natural 1 Bronzer for contouring and Collection Cream Puff lipstick in Angel Delight for the lips. Quick and simple with some lovely products! Seriously, who doesn't love Katy Perry? I never really follow celebrities but I was devastated for her when her and Russell Brand split up! I think the lyrics in her songs since then have really shared her feelings with the World. She's laid her heart out for the World to see! I think Katy always looks incredible and I'm always envious of her look, especially her hair. For the base use Illamasqua Skin Base, MAC Pro Longwear Concealer, Marks & Sparks Loose Powder. For the eyes, MAC Girl Friendly paint pot, Brun eyeshadow and Amazing Shine lashes in style 47 followed by MAC Blacktracks eyeliner. The lips can easily be recreated with MAC Half Red lip pencil and MAC Cosmo lipstick. And not forget blush, for which you can use Illamasqua Naked Rose. So those are three celebrity looks you could recreate with some easy to get hold of products. It's definitely made me want to sell my iPod touch even more, to invest in some statement and go-to makeup product I've lusted after for a while. If you would like to see tutorials on recreating these looks, check out the Pixiwoo YouTube channel, which you can find here. Great post! Love Gwen stefani's makeup looks - always flawless! I'd be wary of Music Magpie, I keep seeing people tweeting saying they've been scammed out of their money, that they've sent items off and then never heard back. Might be worth trying CEX or somewhere instead. LOVE the Gwen Stefani look! I'm a huge No Doubt fan as well. I thought Katy Perry was OK - not a huge fan of pop music to start with - until I heard her live... my poor ears! OUCH!